Ever since I was a kid, I've loved potato pancakes. It started in Kindergarten when we were studying Hanukkah, and we got to sample some latkes. I thought they were so good that when I went home I told my mom that I wanted to be Jewish so I could eat latkes! Over the years, I've tried my hand at making a version of potato pancakes. When I bought Laptop Lunch boxes for the girls a couple of years ago, I tried the recipe for Potato Pancakes that came in the user's manual / recipe book. The girls really enjoyed them. The book suggested making some for dinner as a side dish and serving leftovers as lunch. I thought that was an interesting idea. Recently, I thought about potato pancakes again when I saw this recipe for Zucchini Fritters on The Balanced Platter. I decided to try altering the Laptop Lunch recipe a bit to include some zucchini and carrots. They add some extra nutrition and beautiful color. I also threw in some herbs and Parmesan cheese too. The verdict? The girls loved this version too - especially when dipped in ketchup. If you plan on serving them in a lunch box, you might want to make smaller pancakes (about 2 Tablespoons of mixture) that will easily fit into your storage containers. Grate the zucchini, carrots, and potato and place in a colander. Squeeze to remove excess moisture. In a bowl, combine eggs, whole wheat flour, salt and herb. Stir to combine well. Add grated vegetables and Parmesan cheese. Stir to combine well. Spray a griddle with oil or non-stick spray. Scoop the mixture onto the griddle in 1/2 cup amounts. Flatten out each scoop into a "pancake" and cook about 3 - 4 minutes on each side. For other healthier recipes, be sure to check out Slightly Indulgent Tuesdays at Simply Sugar & Gluten Free. 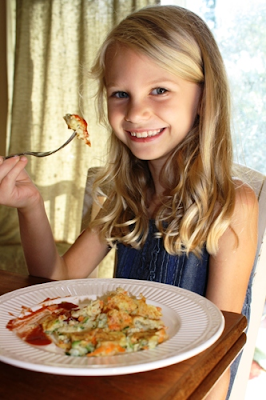 For other back-to-school lunch ideas, check out Ultimate Recipe Swap at Life as MOM. Thanks Kammie! I really enjoyed these...they're so easy to adapt. I look forward to experimenting with other veggies, cheese and spices.